Wet hopped, green hopped, fresh hopped, harvest - call it what you like, there's something quite exciting about brewing with hops that have just been plucked from their bines having grown through the summer. The majority of hops are rushed from bine to kiln as quickly as possible, in order to preserve their precious aroma and flavour laden oils before they start to deteriorate. Some are packaged as dried leaf and others are crushed and pelletised. The hops are then vacuum packed in light resistant packaging and kept cool to retain their freshness. Here in the UK, hop harvesting season is typically mid to late September but of course knowing when to harvest is crucial and the farmer will be checking the crop constantly as harvest time approaches, in order to catch the hops as they reach peak condition. 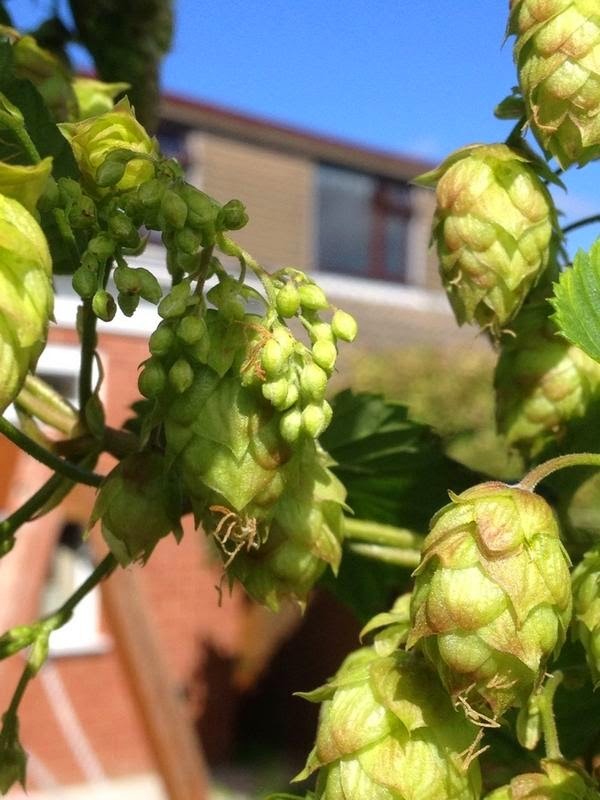 Several varieties of hops can be grown quite readily in the UK and are often found growing wild. At work, we recently volunteered to help out with some groundskeeping at a local church and community centre. One of the tasks I undertook was to cull some wild hop bines that were taking over a wire fence, having intertwined themselves along a good five metres of it. For a home brewer, chopping and bagging up those bines for composting was torture! Had I known that I'd have access to so many lovely hops, I would've lined a brew up that very evening. I did contemplate heading back over to see if any had grown outside of the church's boundary but as it turns out, a chance to brew with wet hops would present itself on twitter. 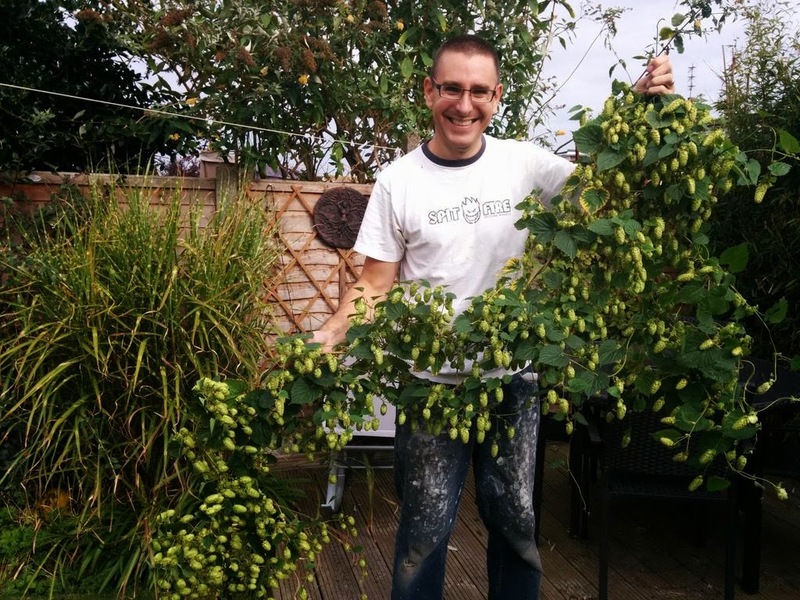 Baron Orm, beer rater extraordinaire over on his blog, had a bumper crop of Cascade looking for a willing brewer who would be prepared to send him some of the resultant beer for sampling. My services were duly offered and arrangements made for posting the hops down post-harvest. Ideally, wet hops should be brewed with as soon as possible but I'd spoken to other home brewers who'd kept them cold/frozen for a while and still got good results. The hops were posted soon after harvesting and arrived at my door within a couple of days, still cold in ziplock bags and were immediately dispatched to the freezer while I planned a recipe and waited for brew day to roll around. The malt bill is mostly Maris Otter with a small percentage of carapils and crystal malts for body and a touch of colour and sweetness. I used dried Cascade for bittering then added the wet hops late on - as many as I could squeeze into the kettle. The resultant wort certainly had plenty of aroma so I'm hopeful that I managed to impart plenty of hop character from the Baron's garden harvest. The yeast is a new one to me but one I've read imparts a nice fruity character to add a little something to the finished beer, which has a predicted 4.8% ABV and 32 IBUs. Oh look at the smile on the Baron's face! I hope I get the chance to try this and taste his juicy Ormskirk Cascades! He does look happy, bless 'im. I'm sure a taste can be arranged once it's bottled. The yeast is a bit of a gamble but will hopefully do the job! Sounds like the brew day went well, can't wait to try some of the resultant beer! This was the 3rd season for my cascade root (bought as a present for me from my beer review buddy @Christopher_R). First year's harvest was 100g of fresh cones, last year's was 300g and this year's was a whopping 1900g (yes nearly 2kg). I've big plans for the stringing of the bines next year to try and get even more! The brew day was nice and smooth, thanks. The hops were smelling good at flameout and I gave them a bit of a stand before transferring, hoping to extract as much flavour and aroma as possible. Sounds like next year you'll potentially have enough for a commercial scale brew!